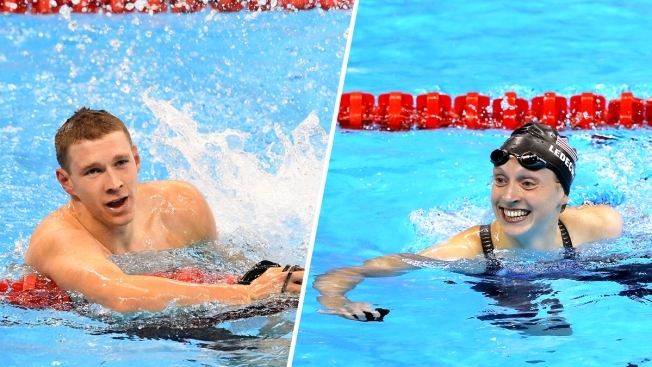 USA Swimming's Ryan Murphy of the University of California at Berkeley and Katie Ledecky of Stanford University. Three California schools - the University of Southern California, the UC Berkeley and Stanford University - sent a total of 124 athletes to the Olympics in Rio - more, if you count coaches - the most of any three schools in the country, according to numbers provided by the campuses and a data analysis of Olympic Committee data. One caveat, however: They're not all competing for Team USA. While USC and Cal have more overall athletes playing at the summer games, Stanford has the most - 29 athletes - from any one school competing for the red, white and blue. The Los Angeles-based USC claims title to be sending the most athletes - 44 - to the Olympics this summer in Rio. But an analysis by Fortune Magazine shows that only 15 are competing for Team USA. Cal sent the second most athletes to the Olympics: 41. Eighteen of those are swimmers, including standout Ryan Murphy, the Cal Bear who took home gold Monday night in the 100m backstroke, which he completed in 51.97 seconds, a new Olympic record. UC Berkeley's newsroom proudly lists the nine coaches who also went to Brazil, bringing the number of people Cal sent to Rio to 50. 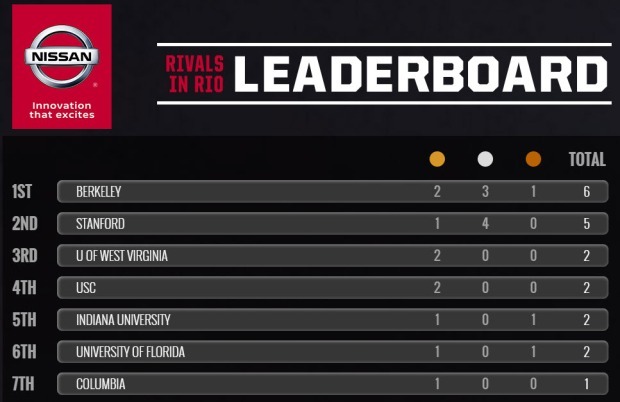 But a closer look at those numbers by Fortune Magazine, shows that 16 are competing for the United States - one more than USC and the same number of UCLA athletes. About a 45-minute drive south from Cal, the prestigious Stanford University in Palo Alto sent five coaches and 39 athletes, including swimming star Katie Ledecky, who smashed a world record and won an Olympic gold medal in the 400m freestyle on Sunday night. Breaking down the numbers, Stanford Athletics said 25 Olympic athletes are graduates of the university, seven are current athletes and five are incoming students. The remaining Stanford-affiliated students who are not playing for Team USA are athletes for countries such as France, Hong Kong and the Czech Republic. Stanford did originally have 31 athletes playing for Team USA, Risso noted, but tennis players and Stanford alums Bob and Mike Bryan dropped out after concerns about Zika. The other schools that have sent the remaining highest number of athletes to the Olympics for Team USA are: Penn State University (13), University of North Carolina (13); University of Oregon (12); University of Texas (12); University of Georgia (11); and Princeton University (11), according to Fortune Magazine. It seems as though that the strength in numbers doesn't necessarily mean more in the ardware department, though. While Stanford had about double the number of athletes competing for Team USA, Cal had racked up more medals by Day 4. As of Tuesday, UC Berkeley's athletes had won two gold medals, three silvers and a bronze for Team USA. Stanford, by contrast, had one gold and four silvers. USC was in fourth place with two golds.